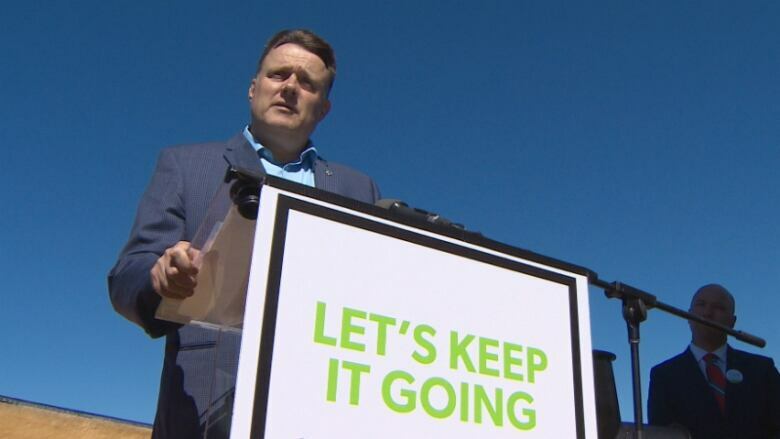 Developers, real estate companies, and construction firms donated 17 per cent of all money raised by candidates during Halifax's last municipal election. Developers, real estate companies and construction firms donated 17 per cent of all money raised by candidates during Halifax's last municipal election. That's one finding of a CBC investigation into campaign contributions in the race that ended in October 2016. Some municipal candidates in the election declined donations from developers in particular, or from businesses in general, because of concerns over conflicts of interest. The city is considering limits on who can donate to campaigns, with public consultations scheduled for May. 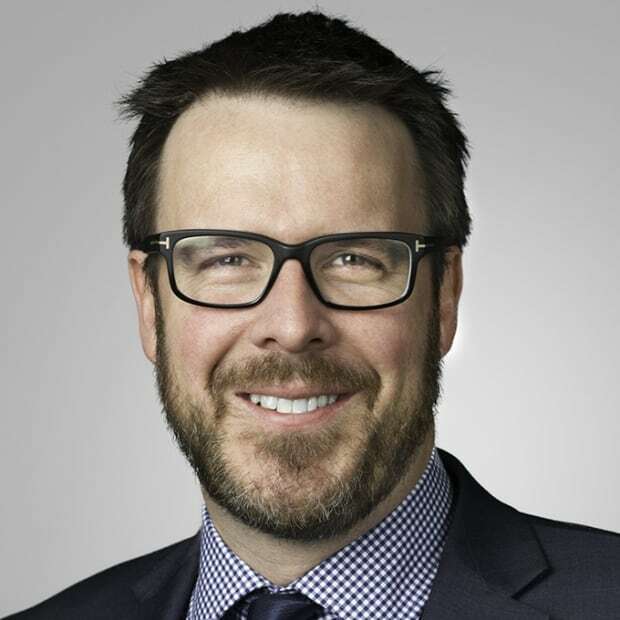 "The question is whether a reasonable person looking at it would think there is a potential to be influenced," said Guy Giorno, an Ottawa-based lawyer who chairs an ethics committee on lobbying with the Canadian Bar Association. "Would a reasonable person think that there's a tension between your public duty to do the right thing and your private interest to look favourably on a donor?" CBC News built an electronic database from printed campaign declarations and labelled donations by source: individuals, developers (and related businesses such as real estate and construction firms), other businesses, unions and charities. 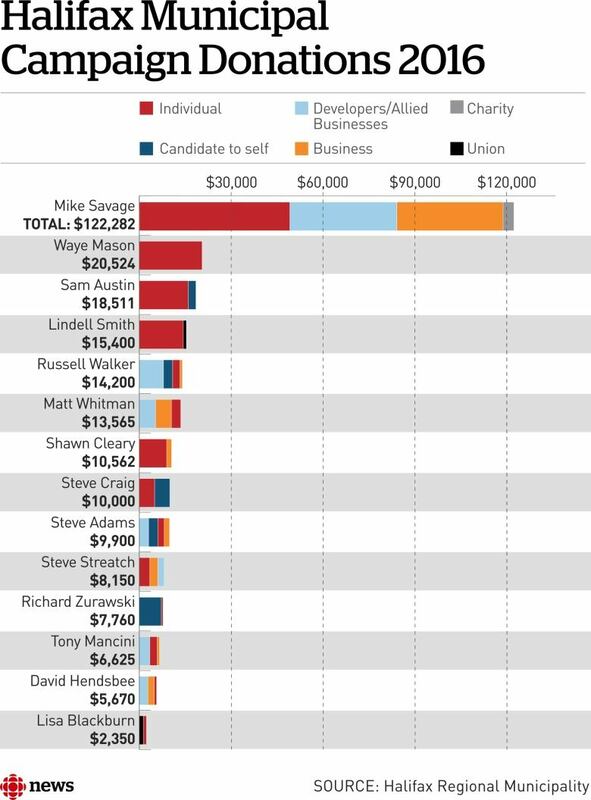 Winners and losers in the races for mayor and council raised a total of $478,370.53 from 1,279 donors. Individuals donated $231,606.51, or 48.4 per cent of the total raised. Businesses of all types donated $162,886.24, or 34.1 per cent of the total. 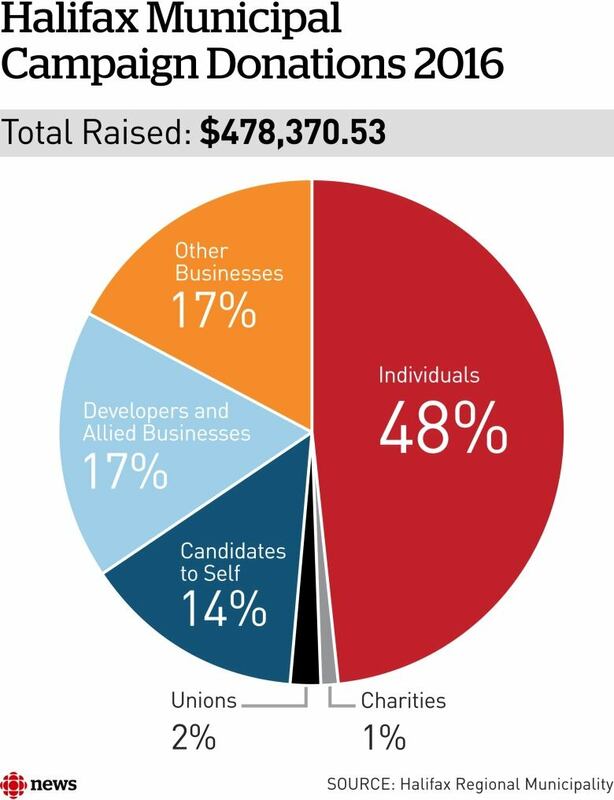 Candidates self-funded to a total of $65,732.65, or 13.7 per cent of the total. Unions donated $11,800.00, or 2.5 per cent of the total. Charities donated $6,345.13, or 1.3 per cent of the total. The percentages in this infographic have been rounded and may not add up to 100 per cent. CBC News chose to break out donations from developers, real estate and construction interests because municipal council has final approval on large projects. Councillors Bill Karsten, Lorelei Nicoll and Tim Outhit were acclaimed and did not submit campaign contribution reports. These businesses donated about $81,000 to municipal candidates or roughly 17 per cent of money raised by candidates. Two companies owned by developer George Armoyan, Geosam Capital Inc. and Armco Capital Inc., gave $8,250 to the campaigns of Mayor Mike Savage and five municipal councillors. Summer Wind Holdings Ltd. gave $5,500 to the campaigns of the mayor and five municipal councillors. Municipal Enterprises Ltd., a division of Dexter construction, gave $3,500 to the Savage campaign and four municipal councillors. East Port Properties gave $2,800 to the mayor's campaign and six municipal councillors. "We thought that supporting the idea of running for office was the real thing to support. And therefore we gave a relatively small amount to each person who ran," said East Port Properties president John Lindsay. Lindsay said some candidates returned his company's donations on principle. He said his goal isn't to influence municipal decisions but to encourage democratic engagement. "It's very hard, demanding work. And we should acknowledge and give a consistent amount across the board," he said. The Halifax-Dartmouth and District Labour Council gave a total of $1,500 dollars to two winning candidates. Council president Suzanne MacNeil said the donations followed a vetting process involving a questionnaire and interviews. "We want to support candidates that support our values, that put social justice to the forefront and are going to be a voice for the sort of progressive, community-oriented policies on council that we like to see," she said. 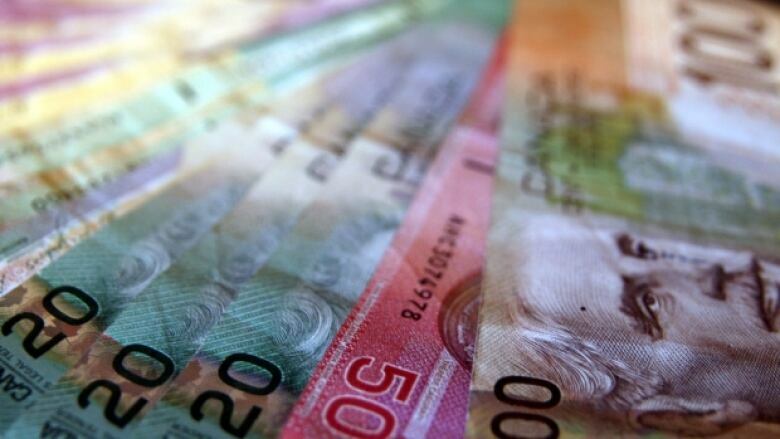 The issue of union donations to municipal candidates was raised last fall in Victoria, B.C., because councillors vote on contracts with unionized city employees. There are currently no limitations on who can donate to municipal campaigns, or how much. Giorno said he believes donations from corporations and unions should be banned in all Canadian elections. Such changes have already been made federally and provincially in Nova Scotia. He also believes a donation cap is appropriate. The maximum donation total for a single donor in Nova Scotia provincial elections is $5,000. The maximum in a federal campaign is $1,550. 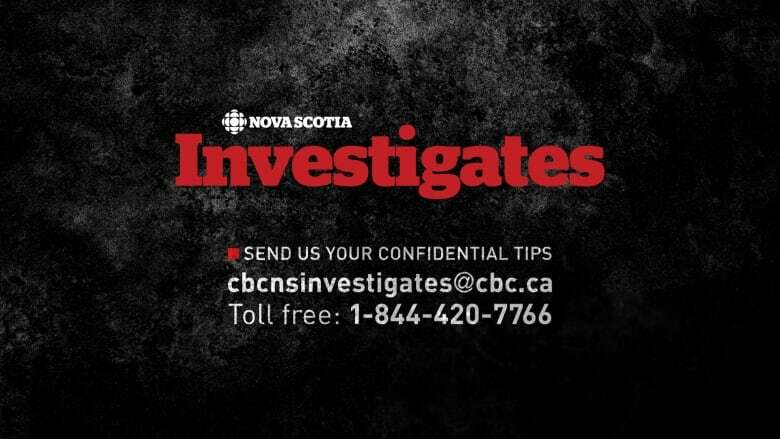 The largest single-personal donation was $5,000, CBC's investigation found. 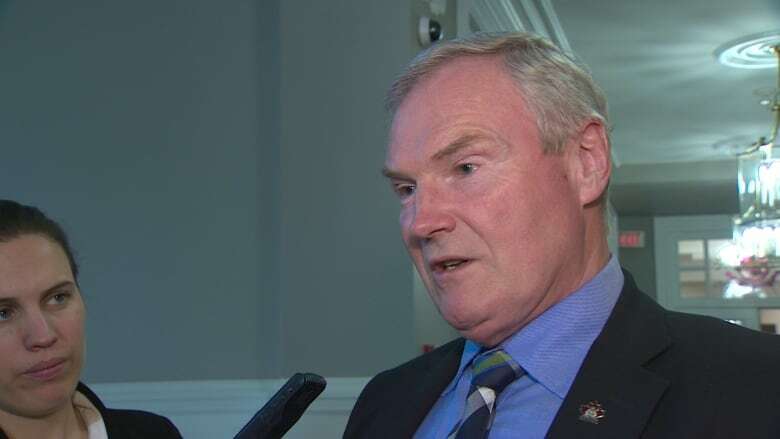 Cyril Burchell gave $5,000 to candidate Chris Poole in Halifax Peninsula North. Shari Craig also made a $5,000 donation to acclaimed candidate Steve Craig — her husband — in the district of Lower Sackville. CBC municipal affairs reporter Pam Berman said to her knowledge, the issue of potential conflict of interest arising from a campaign donation has only been raised once during a council meeting in her 20 years of covering city hall. During a January council meeting, Coun. David Hendsbee requested guidance from a municipal lawyer during a vote on a development project because he'd received a donation from the proponents, Mythos Developments. "I received a campaign donation from this applicant and I'd like to publicly declare an absolution of decision on this process because I believe it would be perceived as being influenced," Hendsbee said at the time. A municipal lawyer advised Hendsbee that if he declared a conflict of interest in the case, it could affect his participation in a future public hearing on the development. The solicitor said he didn't believe Hendsbee had a conflict in the case but would have to do further research. Hendsbee and three other councillors proceeded to vote in favour of the development, which was rejected by a majority of council.